I’m sentimental about handcrafted wooden furniture—the bulk of my home is decorated with it, mostly designed and built by my father over the course of 50 years. So entering the Gardiner headquarters of Wood Classics evokes familiarity and comfort in me. Permeated by the clean smell of teak, the company’s signature timber, the ground floor holds a furniture showroom and an adjacent open-air office. Purposefully arranged, seemingly timeless benches, tables, rockers, and umbrellas fill the front of the space. Large windows open to the west, allowing a view of an outdoor garden, where more display furniture wends through sections of handcrafted trellises, lattices, and fencing. To the rear of the indoor layout a handful of genial-sounding customer service representatives work the phones or proof design blueprints on computer screens. Wood Classics is an employee-owned business, and several of the 60-person staff have held jobs here in design, production, and sales. Contact their organization by phone (as I did several times in the course of researching this article) and without fail a live, knowledgeable person will answer to assist you. “Pleasing customers with first contact”—part of the company’s credo—as well as individualized, quality service, matters at Wood Classics as much as offering the finest merchandise possible, “100% handcrafted in the usa” and completed with no outsourcing. Founders Eric and Barbara Goodman pioneered the company’s progressive organizational structure and operating ideals more than two decades ago. An avid gardener who always enjoyed woodworking, Eric was working a job on Wall Street when he made his first Adirondack chair. By 1984, he and Barbara had built a house in High Falls and had established Wood Classics, running the business out of their basement. The company then relocated in 1989 to two buildings in Gardiner. “They found a niche market because at the time there wasn’t anything out there to compare product-wise,” explains marketing director Sue Hamel, who joined the staff in 2001. Today the all-retail, direct-sales operation has grown to ship more than 30,000 units per year. Though a fire destroyed a good portion of the site in May 2002, Wood Classics was back to filling orders by August of that year after cleaning away debris, airlifting state-of-the-art machinery from Italy and Germany, and remodeling the remaining building to make way for a new manufacturing plant, offices, indoor and outdoor showrooms, and an on-site photography studio. Relying on the work of locally hired craftspeople, Wood Classics makes every piece of furniture they sell on the premises by hand—right down to the pegs—using imported teak for material. Beauty in design comes first, “but it also has to be functional,” says Hamel. “We try not to replicate our competitors, but there’s only so many ways to make a bench. Comfort and durability are also important, but we try to lend an air of artistry and touch of class to each piece.” Take, for example, the slatted 3-Way Adjustable Lounge model that can go from horizontal to nearly upright, customized with sturdy armrests and a handy pullout tray located directly beneath the center of the chair. It projects spa-hipness along with backyard-party practicality. 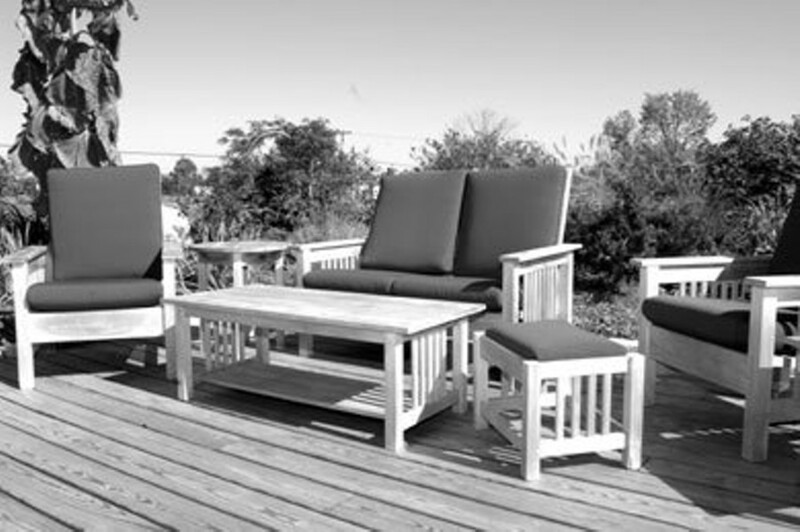 Wood Classics makes dozens of varieties andstyles, and their products fall into three distinct categories: classic outdoor furnishings, such as high-end benches, sling chairs, and swings; garden architecture, including trellises, lattice panels and planters; and teakscapes, a name assigned to a collection of affordably priced furniture fabricated from the same high-quality but lighter-weight teakwood (starting at around $199). Custom engraving is likewise available, perfect for a wedding gift, a memorial garden, or a dedication to a school or park. Accessories such as pillows, cushions, and umbrellas complete the offerings. Made entirely of solid teak—a strong hardwood—the furniture doesn’t splinter or rot, and it dries quickly and stays cool on hot days. “We recommend not staining or treating it with oils but letting the sun turn it a mellow silver-gray,” the marketing director says. They suggest a subtle, polyurethane finish for furniture intended for indoor use, whether to furnish a country kitchen or enclosed porch or to perk up an entryway or mudroom. Fair trade plantation-grown teak arrives to the Gardiner manufacturer direct from global destinations (see sidebar) in rough-milled pallets. Milled to smooth-touch precision in the Wood Classics’ machine shop, it is then cut into various shapes that that are assembled in a warehouse adjoined to the offices and showroom. Touring the humongous combined assembly plant and shipping-distribution center (the size of two airplane hangers) is like walking through a teak forest. Jigsaw pieces of wood sorted by shape and function are stacked several stories high in neat, uniform piles, and cover a good portion of the warehouse. In the most open area, a typical artisan’s workstation is outfitted with handheld tools—cordless power drills, rubber mallets, metal bar clamps, and bottles of weatherproof glue. Construction includes true mortise and tenon joinery—dovetail joints made with square pegs in square holes for greater strength. Every screw hole is recessed and pegged to prevent contact with moisture. Occasionally, Wood Classics does repairs, such as when a tree falls on a piece of furniture or (as in a recent case) when a bear tears an outdoor furnishing apart. Wood Classics sells furniture in three ways. People who find home assembly rewarding or wish to save money may choose a precision-cut kit, with no two pieces attached and all necessary hardware enclosed. The flat pack option arrives preassembled in a few large sections and requires about 20 minutes work to put together. At the top of the line, white glove products come fully assembled (only for orders shipped to New York, New Jersey, Massachusetts, Connecticut, Pennsylvania, Maryland, and Delaware). “All the customer needs to do when ordering white glove is to tell us where to put it upon home delivery,” Hamel assures. “Even though we’re twenty-one years old it still feels like a young company,” the marketing director insists. “We’re always looking for ways to expand without sacrificing quality.” Each year the company reviews every aspect of the business and makes room for new items. It is committed to keeping its product line interesting, especially for repeat customers who have procured Wood Classics furniture since the early days. “The owners have an eye for picking out the latest designs; they’re very well educated,” Hamel says. For example, recently launched in the Spring 2004 line, the Avalon Collection features rounded gothic styling with medieval-inflected lattice supports, accented by muslin- or linen-covered cushions. “Though primarily a direct, mail-order business, we have a growing Internet presence and customers also may come in and purchase items directly onsite in Gardiner. In spring we plant the outdoor showroom, which is beautiful in full bloom,” Hamel promises. For more information about Wood Classics, located at 47 Steve’s Lane in Gardiner, NY, call (800) 385-0030, or visit www.woodclassics.com. America’s largest teak importer, Wood Classics, makes its furniture using replacement-program timber planted between 50 and 100 years ago. Every piece of teak that it sells is genuine Tectona grandis of First European Quality (feq)—the highest grade in existence. Known as “plantation-grown” teak, it comes from Africa, India, and South America. In establishing fair trade practices in these countries, Wood Classics representatives traveled to sometimes remote or impoverished sections and sought out mill owners. Explaining their needs, the stateside company established personal relationships with workers in these areas, endeavoring to boost their small, local industries as part of doing business.